literally nowhere did i say that people don't believe in rápe lmfao you really can't read like to an alarming level. oh you and your creepy backstories about underage people being râped, my bad. AOC in Lousiana is 17. Not technically underage, considering the story I told indicated that it was by a few individuals whom were peers of hers. whew you are one scary dude. the audacity of you to sit in your lil house thinkin up stories of a biracial lesbian woman being râped.... not normal behavio. not now not ever. you are ill.
Fictional to my eyes, but still can be the story that someone may actually have out there. And I know it is not normal behavior, but mental illness is typically a lifelong thing. As I said before I don't believe I will do anything that crazy again, so that already negates the perpetual side of mentally ill.
okay, this ban was because I admitted to the hack on October 6, 2017, where lailai hacked the mods and pinned Karmatica forums. 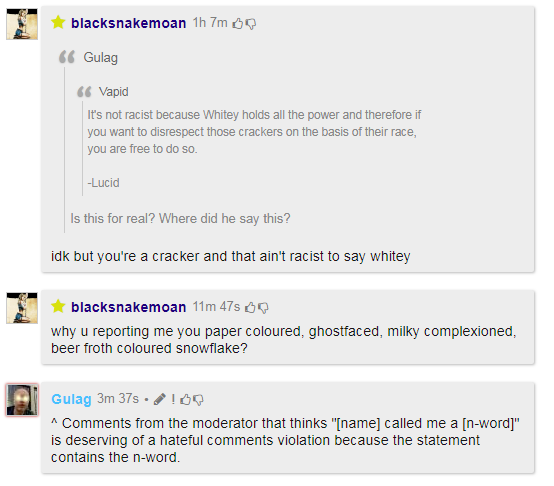 I was clearly trolling when I said that, but admin Charley and moderator JonSnow decided to take it upon themselves to ban me anyway. Again, that was when I legit did that. Anyways, this antagonizing you was simply to point out that we aren't as different as you would like to think. I mean, you didn't take quite the measures I have, but still. I am not the only thing who has done something outrageous and stood by it. You have done some whacko things too, that have been generally been seen as bad things. And look at me now, I have a huge life outside of this site. I am an Eagle Scout now, I am taking the most rigorous courses to increase my ability to succeed in real life. I am still coming on the site to play games, contribute my 10¢ to an argument, and even help to make new things for lucid. In fact, this icon-making thing is something I am starting to do now for my irl job as Operations Officer in my NJROTC unit. I am still trying to become a strong athlete and make attempts to build myself up to 16th nationally ranked youth male 18 and under for Orienteering. There is obviously a lot more, a very different part of me that you are neglecting to see outside of the "fake raepe thing that happened a year ago"
There is probably a more sensible part of you outside this website as well, and me taking a crack at your job was to kinda remind you that there is an outside life we all deal with as well, outside of our "monkeys throwing poop at each other" types of arguments. So yeah, just admit that me doing something stupid a year ago shouldn't become your automatic view of me, because there is evidence all around that I am no longer like the way I was then. This is not a call for friendship, this is rather a call for peace, (as I can see, we have very different perspectives that would clash and get away with friendship, and also I am a child and stranger danger exists).